White creamy mousse in between two layers of raspberry jello with raspberries. 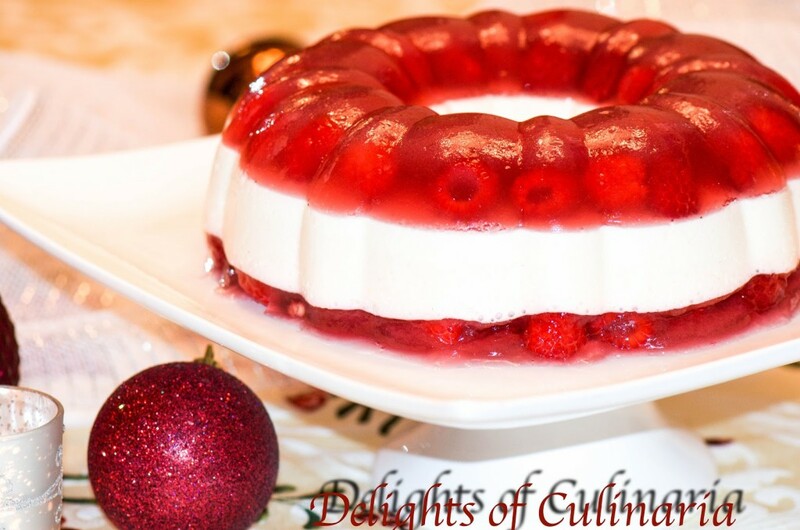 A simple and festive dessert that will look elegant on your Holiday table.You can substitute for strawberry or apricot flavor jello and any type of berries. Fresh raspberries or sliced strawberries. Bundnt pan or deep glass baking dish. * You can substitute for cream cheese, although taste will be slightly different.But still good. Mix 1 package of jello and 1 packet of gelatin with 3/4 cup hot boiling water until dissolved.Add 1 cup cold water and continue to mix. Arrange raspberries to the bottom of the pan. Pour the liquid jello in the pan.Refrigerate until jello is firm. Mix 2 1/2 packets of gelatin with 1/3 cup col water. Heat milk ( you can use microwave). Add hot milk to gelatin.Mix until gelatin completely dissolves. In a mixing bowl beat together mascarpone with powdered sugar.Add sour cream and continue beating. Gradually add cooled milk with gelatin.Beat. Gradually add heavy whipping cream continue beating for 2-3 minutes. Pour this mixture on top of jello and refrigerate for about 1 hour. Mix 1 package of jello and 1 packet of gelatin with 3/4 cup hot boiling water until dissolved. Add 1 cup col water and continue to mix. Arrange raspberries on top of the white layer. To remove Jello from bundnt pan,Fill sink with warm/hot water. Dip the pan in water for about 15-20 seconds( all the way to the top edges, careful not to get water on the jello). Put the platter or tray on top of the bundnt pan, turn it over to release the ring on the platter. Yes it is!! !we love it. Thank you Ilona for your feedback! Hello Nadia! I have a plastic bundt pan, do you think the jello will stick? I am afraid that if I will make this, it will get stuck and the whole thing will be ruined? Hi Oksana,I really don't. I never had experience with using plastic.You can use a glass dish(like pyrex or any other).sorry…. Where do you buy mascarpone creme? What section of the store? I like to get it at costco,but they don’t have it all the time.It would be in fancy cheese department most of the time. Also trader joes and winco has it in the cheese section. Sorry one more question. Is it mascarpone cheese or creme?